Devin sat down to answer a few questions about his motivation to open Colvos, his management philosophy, and most importantly... tacos or pizza? My entry into this field is unique. Most people get a construction management degree and then work for a general contractor. I have a degree in Physiology and then worked for a biotech company in facilities & operations when I graduated from school. It was interesting and I got to learn a lot about building systems and client/vendor relationships. One of the vendors we had was a general contractor, and after understanding what they did I became interested in it. I was offered an entry -level job by one of our vendors, so I took a 20-percent salary cut and decided to start over in construction. I got to understand the client side because I was the client. For occupied tenant improvement projects, particularly, understanding how to run those efficiently so as not to impact the occupants (because I knew the pain points on the client side! ), correlates to a higher level of customer service. Devin signing Colvos' first project contract early this year. Can you speak to the current state of building & construction in the Puget Sound region? How does Colvos fit into the changing landscape? We think Tacoma is going to be a growth market for a long time, partially because Tacoma tends to absorb some of the coattail benefits of being Seattle’s neighbor. 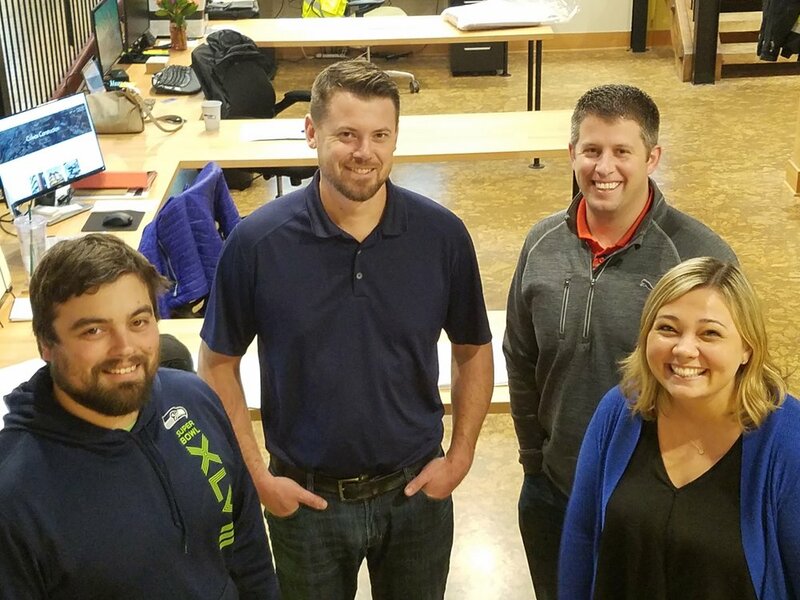 Tacoma’s also a bit underserved on the general contractor side: there are some GCs who’ve shut down or left town recently, and others that have grown into a different market to serve larger projects. When the cycle’s high, there are labor shortages so contractors tend to hire less qualified employees and client service suffers. Here at Colvos we have a set of employees who have worked together for a long time, even though we’re a new company. Starting a new business, you have an opportunity to slough off some of the baggage that naturally accumulates over time, and we’re positioned to offer great service to our clients. I think that, by nature, businesses can sometimes accumulate bad habits or lose focus of what their mission and objectives are. As a fresh, new company, we don’t have all those burdens… including financial burdens, so we can be competitive on the cost side as well. How do you see the Puget Sound region changing in the next two years, and how do you anticipate Colvos responding to that change? Over the next two years I expect more of the same – fairly aggressive growth, barring some sort of unforeseen event that could disrupt the economy. I think there’s going to be higher-than-average growth in Tacoma, and I think Seattle will continue to experience growth, with a little bit of slowing. Multi-family, commercial, office, assisted living, and hospitality, will all continue to be strong markets. Ultimately, what’s probably going to kill the cycle is the fact that there’s not enough labor to meet the demand for construction. Our industry is suffering because 1) the amount of construction managers that graduate from college every year can’t meet the deman, and 2) Craft labor isn’t being strongly promoted to younger folks. They don’t tell you to be a plumber/electrician/pipefitter, etc. ; they tell you to be a computer programmer/data analyst; the consequence is that there isn’t enough qualified craft labor coming out, and that produces labor shortages which translates into cost increases. Name one trend in your field that you are either currently embracing or bucking? The (possibly temporary growth cycle) trend of bringing on less-than-qualified personnel is not something that we’re participating in. Also growing too fast, getting too big, and being forced to take on less than A team players. I think we are embracing more of an integrated approach to the entire project process, which includes the preconstruction phase. We want to be embedded with that project and that client from the very start to the very end, instead of just coming in when the construction drawings are complete, and then bidding and building. Also, technological trends that include cloud-based construction management software, cloud-based data storage, and paperless processes: our contracts, subcontracts, and pay applications are mostly submitted electronically, which reduces costs for everybody involved. Personally, preconstruction and business development. I enjoy helping our clients get something off the ground, and I enjoy seeing our clients’ businesses be successful. I also enjoy that part of my job is to bring business in the door and put a team in place that can execute the vision and the mission. What’s the most significant project you’ve worked on in your career and why? I worked on a $75 million tenant improvement project for Safeco when they moved their campus from Redmond to downtown Seattle. That was at an early stage in my career, but it was a 2-year project with the same team for the entire 2 years. There was a lot of opportunity for me, personally, to learn and refine skillsets because I was given a lot of responsibility at a fairly young age. When you have a lot of responsibility on a project like that, you really get to see the consequences of the decisions that are made by all the team members - what’s beneficial for the project or the client, and what’s not. It gave me a good foundation for understanding and mastering the life cycle of construction projects. Why did you choose to create Colvos and/or what do you most enjoy about working here? It’s always been a goal of mine to start my own business. I was fortunate enough to have team members that were willing to launch a business with me and I had the support of clients, subcontractors, vendors, and colleagues within the industry that encouraged me to do it. I was also fortunate that the timing with the economy and the market cycle was favorable. I enjoy the people I work with and the fact that we have the opportunity to make the business anything that we want. How do you encourage creative thinking or leadership within the company/team? My philosophy is that you hire smart, qualified people and give them the tools to do their job and the framework in which to do it; smart people excel under those conditions, and if they don’t then this probably isn’t a good place for them. We aren’t very structured, so I think under those conditions independent thinkers and leaders can thrive because they’re somewhat unconstrained. If they love what they do and are good at what they do, then I think they’re going to excel in that environment. I like to fish, boat, do things with my kids, travel, play golf (I’ve been playing a lot of golf this summer! ), and I like to visit new restaurants. Tacos or pizza? Favorite spot in the region to enjoy? I’m kind of a breakfast burrito aficionado. I went to school in Tuscon and I got addicted to breakfast burritos there, so I would say the chorizo breakfast burritos from Taqueria El Sabor.